It's a Pity You Don't Have Something Else to Do! At bottom right corner, inscribed "78" in sepia ink by Goya; at bottom, inscribed "Lastima es qe. no te ocupes en otra / cosa" in sepia ink by Goya. Throughout his work, Francisco José de Goya y Lucientes expressed himself freely and often with humor. This page from his "Album C" seems, at first glance, to be one of his depictions of working girls. This young woman, however, wears a fine dress, jewelry, and a rather coy hairstyle and displays a graceful, almost cultivated bearing. She is pretty, not vacuous, but her questioning gaze and awkward cradling of the jug betray her uncertainty. Goya's caption, the drawing's title, tells the whole story: He admonishes her for playing at being a peasant, a practice then fashionable among the upper classes. Even as he rebuked this young woman, he flattered her, setting her alone and off-center on the sheet with a few pen strokes and a bit of wash to give her grounding. 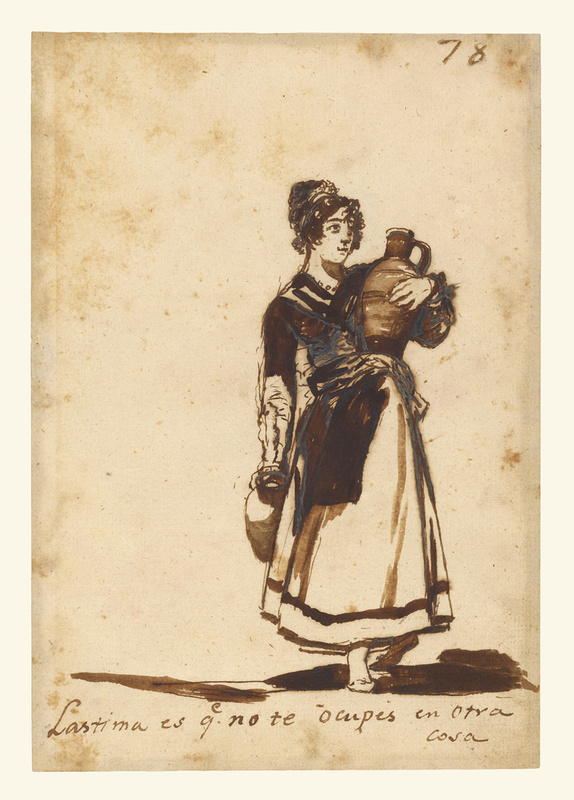 At least seventy years old when he made this drawing, Goya remained fluid and spontaneous in his technique, quickly capturing the swaying of her skirt and the little crinkles in her sleeve.